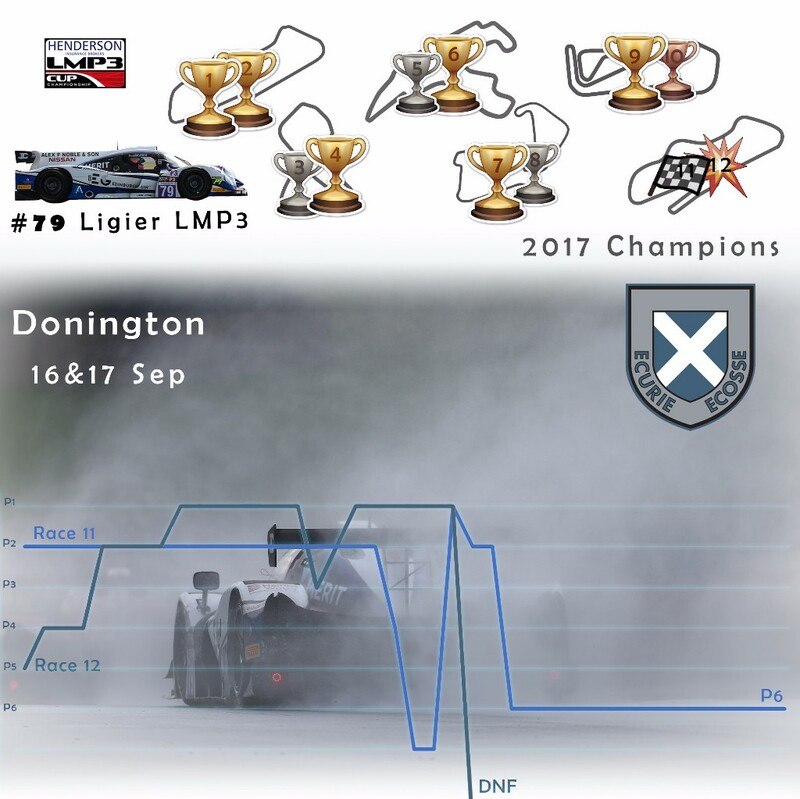 Having started fourth and stormed through the field to pull out a lead of over 40 seconds, Ecurie Ecosse were left disappointed on Sunday (17 September) at Donington with the first failure to finish a Henderson Insurance Brokers LMP3 Cup Championship race all season. Alasdair McCaig and Colin Noble finished the opening race of the weekend in sixth position after contact with a rival forced a puncture and extra stop. McCaig started fourth for the season finale after rain interrupted the ten-minute qualifying session. He then put in a phenomenal drive to lead convincingly at the half way stage. With the track conditions deteriorating, Noble was a passenger as the Ligier aquaplaned off the circuit and into the first retirement of what was a sensational championship-winning campaign. “We got up into the lead with the #3 car coming with me and then he out-braked himself and ran into the back of me into the last turn, giving me a puncture. “First of all, it’s been a fantastic season for us in the Henderson LMP3 Cup. We’ve won half of the races and to claim the title ahead of the final meeting was a fantastic result for us and a credit to all of those at Nielsen Racing and our partners. Ecurie Ecosse now heads to Spa-Francorchamps for the sixth race of the Michelin Le Mans Cup this weekend.